UP Dangal has failed to secure a single win in their two encounters so far while Mumbai Maharathi have registered one win and loss. In order to climb up the league table, both the sides will be looking to pull one over each other and it will be interesting to see how, especially, UP Dangal fare in the upcoming clash. 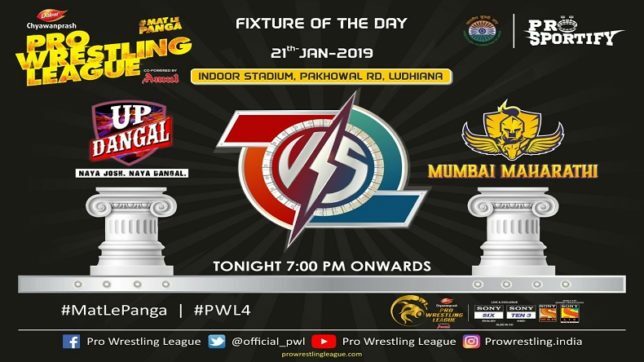 After enduring a poor start to their campaign in Pro Wrestling League (PWL) season 4, UP Dangal will be looking to open their account on Monday when they face Mumbai Maharathi in their third PWL 4 encounter. On the other hand, the Maharathi has also overseen an underwhelming beginning to their ongoing campaign and would want to climb up in the PWL league table. Mumbai Maharathi has a stellar line-up which comprises of Vinesh Phogat, Betzabeth Angelica, Deepak Poonia, Ibragim Ilyasov and so on. For UP Dangal, Navjot Kaur, Vanesa Kaladzinskaya, Sarita among many others will lead the mantle of the team. UP Dangal's Pankaj Rana to lock horns with Mumbai Maharahthi's Harphool Gulia. Harphool giving a tough competition to Pankaj as he is leading the bout by 2-0. Harphool at a lead of 4 by the scores being 4-0 at the half time. Epp Mae maintaining the lead in the second half by the scores being 4-1. Epp Mae won the Breathtaking bout and made it for UP. UP at a lead of 2 in the game. Next bout between UP Dangal's Epp Mae and Mumbai Maharathi's Zseneth Nemeth. Epp Mae in aggressive mode. Epp may lead the bout by a score of 2-1 by the half time. Georgi in attacking mode. Baitseev made a comeback by scoring one point against Georgi. Georgi Snatched the victory from Mumbai's Baitseev by a lead of just a single point. UP Dangal at a lead of 1 point in the game. UP Dangal's Georgi Sakandelidze going to battle it out against Mumbai Maharathi's Baitseev Vladislav. Georgi taking the lead by a score of 1-0. UP Dangal at a lead of 1 at the half time with the scores being 1-0. Vinesh in an aggressive form in the second half. Vanesa made an outstanding comeback by levelling up the score to 3-3. Vinesh Phogat bagged the victory by defeating Vanesa by a score of 5-3. Vinesh equalized the score by 2 each. Mumbai Maharathi's star player and captain Vinesh Phogat to have a bout with UP Dangal's captain Vanesa Kaladzinskaya for the 53 kg category. Vinesh scored her first point in the bout by technical superiority. Vinesh at a lead of 1 point by the score being 2-1 at the half time. Deepak made a comeback by scoring one point against Irakili in the bout. Deepak made it like a champ and thrashed Irakili by a nail-biting score of 3-2. Delhi trying to level up the lead. UP Dangal's Irakili Misituri going to have a clash with Mumbai Maharathi's Deepak Punia for the 86 kg category. Both the grapplers giving a neck-to-neck competition to each other. UP Dangal's Irikali at a lead of 1-0 from Mumbai Maharathi's Deepak at the half time. Sarita maintaining the attacking mode in the second half. Sarita smashed angelica by a score of 6-1 and showed a dynamic performance. UP Dangal at a lead of 2 in the game. UP Dangal's Sarita Mor going to lock horns with Mumbai Maharathi's Betzabeth Angelica for the 57 kg category. Sarita in attacking mode. Sarita giving a tough fight to Angelica by maintaining a lead of 3, while the scores being 4-1 at the half time. A breath-taking performance by Jitender in the first bout. Smashed the star player of Mumbai, Sachin Rathi by a score of 14-0. This Bout proved to be an unexpected one. First bout going on between Sachin Rathi of Mumbai Maharathi and Jitender of UP Dangal. Jitender at a lead by 8-0 at the half time. A super energetic performance by Jitender.